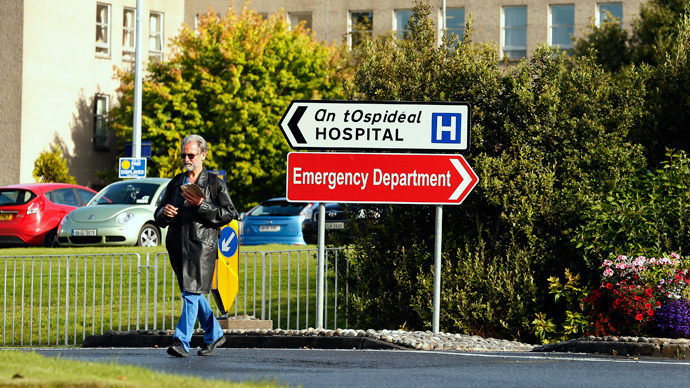 An investigation into emergency health care services in Northern Ireland has uncovered “degrading and inhumane” treatment in the region’s accident and emergency (A&E) wards. The findings released on Wednesday by the Northern Ireland Human Rights Commission exposed inadequate care standards on a number of wards. It found some A&E departments in the region allowed patients to go without water, food and pain relief for days in overcrowded and understaffed wards. It found that many patient interactions with staff were “positive,” but services were let down at times by a lack of kindness and attention from health professionals. Further evidence revealed cases of elderly patients being transferred to or from their homes alone at night in taxis, suggesting they are not a priority. Blind and partially sighted patients also endured a “lack of physical provision,” the inquiry revealed. Some of the wards inspected lacked buzzers and braille information, making it harder for vulnerable patients to get around. Sam Kilpatrick, who is blind, contacted the inquiry claiming he was abandoned on a hospital trolley at Lisburn’s Lagan Valley Hospital and left alone for over two hours. He realized he needed to go to the toilet, but there was “no way of alerting a nurse” as he was “left in a private room,” he told the BBC. “The nurse’s manner was not nice ... I didn’t receive any food or water during that time,” he told the broadcaster. “At the Lagan Valley Hospital emergency department there is no provision for disabled people,” he added. The inquiry also found that patients with less common conditions “reported negative experiences from staff, including feeling laughed at,” while bullying was a common issue. “Some felt bullying was not intended but rather symptomatic of behaviors that can occur in a busy [A&E],” it said. Some argue workplace stress among healthcare professionals is a key reason behind these poor standards. Earlier this year it emerged many nurses were unable to cope with the “pressure” of working in A&E because of intensive working hours and understaffing in the UK overall. In March, Prime Minister David Cameron pledged to provide Britain with a “properly staffed” National Health Service (NHS). “With a future Conservative government, we would have a truly seven-day NHS,” he said. Northern Ireland’s Commissioner for Older People Claire Keating told BBC Radio Ulster the report shows “emergency departments must be properly resources and planned for.